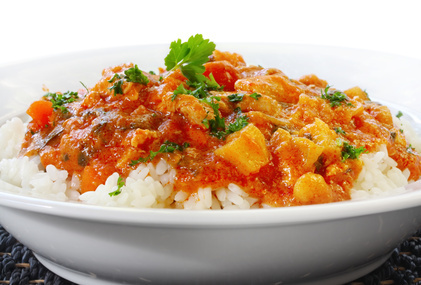 This is a curry base recipe and you can add your preferred ingredient. See other recipes. Make up a big batch and freeze some of it to be used for another time. Heat the oil until hot then add in the onions, garlic and ginger. Fry the onions, garlic and ginger in the oil for about 5 mins then add in all the spices. Stir for a few minutes then add in the tomatoes. Keep on heat for a further 20-30 mins until the onions are almost macerated, stirring regularly. Add water a little at a time to stop the mix sticking to the base. When the water dries and the mix looks like a reddish paste it is now ready for adding in the main ingredients.